Japan Food! Eat Soup Curry in Sapporo Japan! Japan Food! Soup Curry! The Best Places in Sapporo Japan? My favourite Japan food. 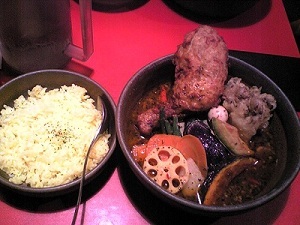 Soup curry comes with vegetables, rice, and various toppings and is a specialty in Sapporo Japan. It's a challenge in itself and fun to visit all the soup curry establishments darted around the city. 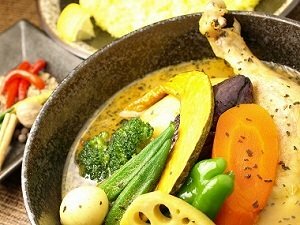 Still, Hokkaido is the best place to eat soup curry due to its rich source of fresh vegetables and ingredients. 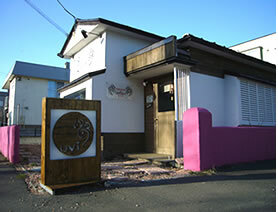 There are so many establishments in the city that its very difficult to say which Sapporo restaurant is the best. Everyone has a different opinion and it seems that everyone living in Sapporo loves soup curry just as much as I do. So of all the soup curry restaurants I have experienced so far(I usually try a new place a couple of times a month) here are my favourites, in no particular order, but this list will probably change next month..... or the next. This Japan food rocks! Is this the best soup curry shop in town? Possibly. A bit of a mouthful of a name. Nishitondendori is actually the name of the road where it’s located. Not very original but easily found, I guess. The hamburger is awesome! It’s a huge handmade softball sized lump of meat. There is also the option of having cheese inside. Definitely get it with cheese inside. Samurai is defintitely in my top 5 favourite soup curry restaurants. Samurai Soup Curry is awesome and has four branches around Sapporo Japan. The soup here is rich and thick and you have three options to choose from: the regular soup, which is a mix of tomato and meaty stock, the tomato base soup, and the coconut base soup. The Odori area has traditionally been underpopulated with soup curry (not curry soup) restaurants so if you feel like eating some spice,Garaku is defintely my reccommendation. It has a very lively atmosphere and is opened planned, decorated in 70s and 80s music memorabilia and always seems to be frequented by young trendy Japanese people, especially girls. 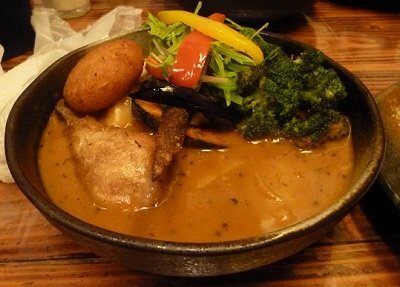 It's hugely popular and the soup curry sometimes gets sold out fast. Also be expected to wait during peak dinner and lunch hours. The theme of Voyage is an Indian/Buddhist/hippy feel and is very warm and friendly and always busy but the wait is never more than five minutes. The menu is great and they have a different soup depending on what day you go, so you have the choice of the soup of the day or the regular soup. They always play cool music, like old school Jamiroquai. The soup curry here is delicious with some great herbs and good amounts of spice. The spice level ranges from 0-50 and if you want to go spicier (crazy people) it costs an extra 50yen. Even going for a low spice level such as 5 is spicier than at other establishments you have visited. I went for a level 7 and it was puuuurfect! The great thing about Lavi Lavi is they have a 'Soup curry of the month' which I have not seen anywhere else, so far. Dominica is a little soup curry shop in Odori was recommended to me by a friend and boy, I was not disappointed. 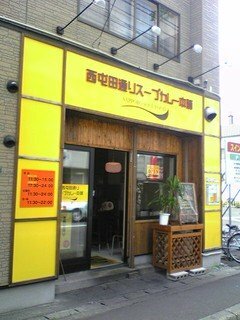 It’s usually very difficult to find a good soup curry restaurant in the downtown areas of Sapporo Station and Odori. What is so unique about Okushiba Shouten soup curry is that it is a converted house situated in a residential area so it feels like you are having dinner round a friends house as opposed to a restaurant. 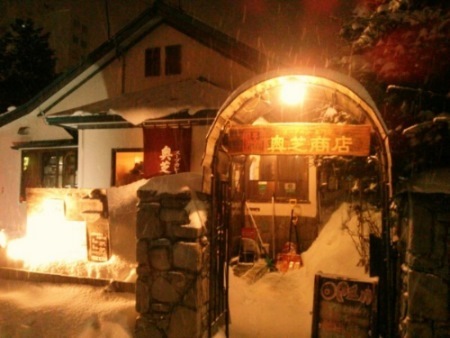 For more restaurants in Sapporo check out the Sapporo Local Restaurant Guide. 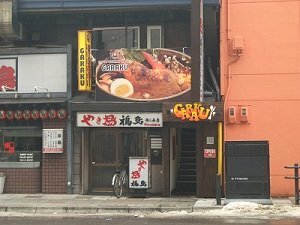 Where's The Best Soup Curry in Sapporo? Found a hidden gem? Share your review about the soup curry restaurant you dig the most!